Snaidero Middle East offers households in the Middle East Brad Pitt’s choice of kitchen, the Ola20 from Snaidero. 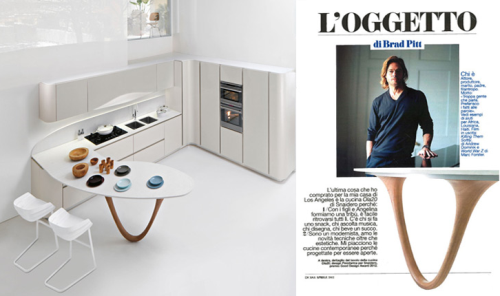 The A-list actor and producer, Brad Pitt, discusses his latest Los Angeles home addition, the Ola20 kitchen from Snaidero Italy, in a recent article published by Divisione La Republica magazine. Pitt briefly explains how the Ola20 kitchen provides the perfect kitchen solution to meet his family’s needs, as well as his aesthetic requirements. Snaidero Middle East, located in Zouk Mosbeh, Lebanon, supplies the customizable, modern, and space-efficient Ola20 kitchens, developed by Snaidero Italy and designed by Pininfarina. The top-of-the-line, award-winning Ola20 kitchen meets modern tastes and adapts to contemporary lifestyle needs. The kids, Angelina and I form a tribe. It’s easy to meet all together in the kitchen. There’s someone having a snack, someone listening to music, someone drawing, someone drinking fruit juice. I'm a modernist; besides technical innovation, I love the aesthetical novelties. I like the contemporary kitchens because planned to be open." Snaidero Middle East provides high-quality and functional Ola20 kitchens, utilizing and maximizing available space and designed to fit customer space requirements. Snaidero Middle East customizes Ola20 kitchen solutions to customer needs, with bases, cabinets, and wall units flexible up to the cm. Upon request, wall units and cabinets can have heights reaching the ceiling. Recently the Chicago Athenaeum: Museum of Architecture and Design recognized Snaidero for the innovativeOla20 kitchen. Ola20 received the "Good Design 2011" award in the Kitchens and Appliances category. Located in Lebanon, Snaidero Middle East supplies Snaidero kitchens, as well as manufactures Medline local home furniture and kitchens. Furthermore, the company holds sole distributorship of numerous European brands of kitchens, wardrobes, walk-in closets and living area accessories.